Americans say their nation’s colleges and universities compare relatively well with those in other developed countries – but the public offers more negative assessments of the state of U.S. public schools. 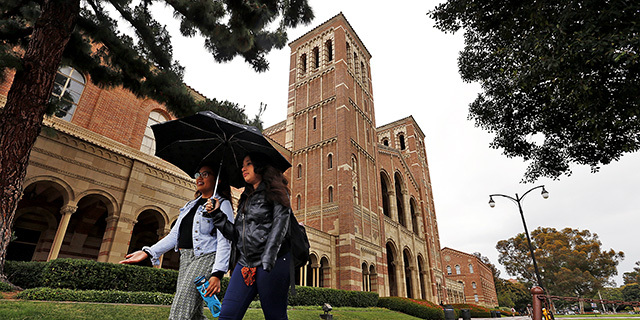 About half of U.S. adults say the country’s colleges and universities are either the “best in the world” (16%) or “above average” (35%) compared with those in other developed nations, according to a recent Pew Research Center report. By comparison, just 18% say U.S. public schools rank above average or higher internationally, while 41% of Americans say public schools are below average (37% rate them as average). On many measures of how the United States fares relative to other countries, Republicans are more likely than Democrats to view the nation as performing better. This extends to views of the country’s public schools. Though few in either party say U.S. public schools are the best in the world or above average among developed nations, Republicans and Republican-leaning independents (22%) are more likely than Democrats and Democratic leaners (14%) to say this. And Democrats are substantially more likely than Republicans to say U.S. public schools underperform their international counterparts: Nearly half of Democrats (47%) say U.S. public schools are below average compared with schools in other developed nations, while just 34% of Republicans say the same. Liberal Democrats offer particularly critical evaluations of the nation’s public schools relative to those in other countries, with 56% saying U.S. public schools are below average (compared with 38% of conservatives and moderates in the party). Notably, there are no partisan or ideological gaps in evaluations of American colleges and universities. Roughly half of Democrats and Democratic leaners (54%) and a similar share of Republicans and Republican leaners (51%) say U.S. postsecondary institutions are above average or the best in the world. Although there is not a significant partisan gap in views of how American higher education compares with that of other countries, previous research by the Center has shown that Democrats are considerably more likely than Republicans to say colleges and universities have a positive effect on the country – and GOP views have shifted more negative over the past few years. 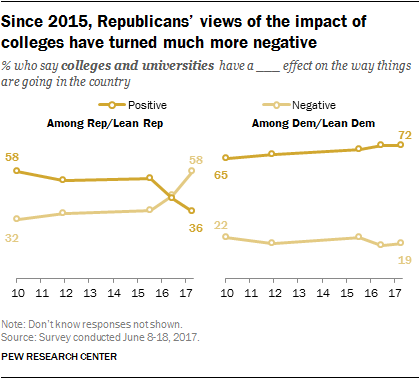 In 2017, just 36% of Republicans and Republican leaners said colleges and universities have a positive effect on the way things are going in the country, an 18-percentage-point decline from two years prior. By contrast, 72% of Democrats and Democratic leaners said colleges and universities have a positive effect, which was little changed from prior years. This partisan dynamic also extends to views of college professors. On a “feeling thermometer” ranging from 0 to 100, a Pew Research Center study last fall found that Republicans gave professors an average rating of 46, compared with an average rating of 71 among Democrats. In the same survey, Americans across the political spectrum rated teachers warmly, though there were still significant differences by party. While Republicans gave teachers an average rating of 72, Democrats gave teachers an average rating of 86.